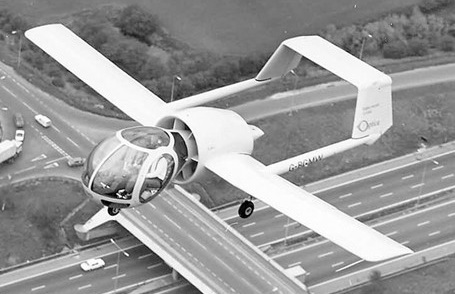 Combining the visibility of a helicopter with slow-flying capabilities, the original concept for the Edgley EA7 Optica was as a three-seat touring aircraft. Designer John Edgley, at that time a post-graduate student at the Imperial College of Science & Technology, London, began the final aerodynamic design in 1974 and a model was wind tunnel tested in 1975. Construction of a prototype began in 1976 in London, and final assembly was carried out at the College of Aeronautics, Cranfield. The first flight was made on 14 December 1979 with a 119kW Avco Lycoming O-320 engine but this was later changed to a 134kW IO-360. The Optica relies on ducted fan technology and a NASA designed aerofoil for its abil-ities. A one to one direct drive connects a five-bladed fixed-pitch fan to a Lycoming IO-360 200 hp fuel injected engine, enabling quiet operation and low vibration levels. As well as the normally aspirated Lycoming (TBO 1800 hours), a 210 hp turbo-charged Lycoming fit was available and a tur-bine installation was also being considered. Mounting the whole cockpit assembly ahead of the fan and engine gives the pilot and passengers a 270 degree panoramic vision, plus almost vertical downward vision; the cockpit canopy design allows photography through the panels. The tricycle landing gear is fixed and unfaired, with maintenance-free solid suspension, and the airframe is of all-metal construction; its internal cabin width of 1.68m permits three-abreast seating, while baggage space and positions for mounting specialised observation equipment are provided behind the seats and in the unrestricted floor area in front of the two passenger seats. A considerable flap area provides for STOL capability, enabling continuous en route flight at a very low loiter speed of 50 kts (57 mph/92 kmh). A power setting of 65 per cent covers 570 nm (1,050 km) at 94 kts (108 mph) for six hours with normal reserves. A mixture of cruise and loiter enables around nine hours airborne while maximum loiter stretches out to 13 hours. Gliding characteristics are good with an approach speed of 65 kts and a threshold speed of 45 kts, 5 kts above the stall with 20 degree flap. The ROC (rate of climb) is around 720 fpm to a ceiling of 14,000 feet. 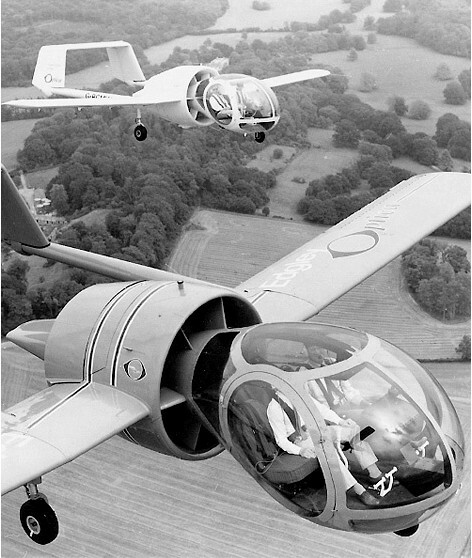 Considerable interest was shown in the Optica from the time of its first appearance, and at the 1981 Paris air show the announcement of a first production order was made - 25 for Australian distributor H. C. Sleigh Aviation Ltd.
With GBP 2.3-million funding, Edgley bought Old Sarum airfield near Salisbury, and set up a production line in existing hangars. Initial plans covered the construction of 200 aircraft, beginning in mid-1983, with first production models to be available at the end of that year for approximately GBP 55,000 each. However, the crash of an early production aircraft in 1985 led to the collapse of the company. In October 1985, Optica Industries was formed to continue activities, and by the end of 1986, 15 aircraft had been produced. In January 1987 the factory was destroyed by arson along with all but one airworthy Optica. The company was reformed again as Brooklands Aircraft (later Aerospace), and the Optica Scout, renamed the Scoutmaster, returned to production with a 194kW Textron Lycoming O-540 engine. Six had been delivered to customers by the end of 1989. In March 1990, after building another five aircraft, all manufacturing was halted and a receiver called in. In July 1990 the Optica project was acquired by Lovaux Ltd at Hum and a resumption of full-scale production and marketing was planned.